It opens/closes just by pressing the F1 button. 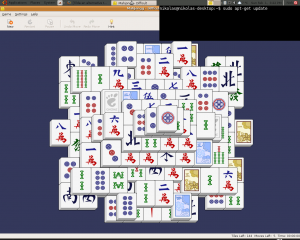 Stays always on top, so it is easy to use it with an open firefox. In other words it is great when you need to copy/paste from a tutorial you read. It can be configured to be transparent and to have cool colours. I know this is not so important, but who doesn’t like the eye candy? This way tilda will open each time we login to our Ubuntu window system. Now we need to tweak tilda a little. Well here the only thing we actually want to do is to make Tilda open hidden. 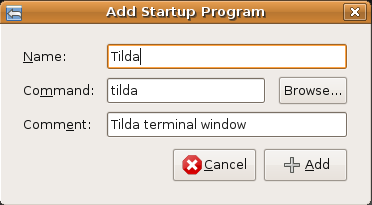 The first time you will open Tilda you will get the Config screen. If you don’t just right click on the Tilda window and go to Preferences. There you should click the “Start Tilda hidden” button. Other cool options are in the “Colors” tab and the “Enable Transparency” in the “Appearance” tab. This entry was posted on Sunday, February 1st, 2009 at 3:19 pm	and is filed under Applications, How to. You can follow any responses to this entry through the RSS 2.0 feed. Both comments and pings are currently closed.